You should always put your best foot forward in any internship. But with many students using their internships as a stepping stone into a full time job opportunity with that organization, it’s even more important to demonstrate your knowledge and skills throughout your experience. 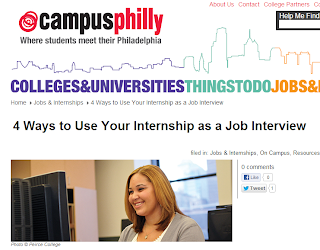 We were tapped by Campus Philly to share more insight on this topic, so I authored a guest post on its website titled, “4 Ways to Use your Internship as a Job Interview.” Flip over to the article to read my advice in full, and then join the internship conversation in the comments section.